Amazon.com description: Product Description: NEW YORK TIMES BESTSELLER â¢ In this provocative, startling book, Robert D. Kaplan, the bestselling author of Monsoon and Balkan Ghosts, offers a revelatory new prism through which to view global upheavals and to understand what lies ahead for continents and countries around the world. 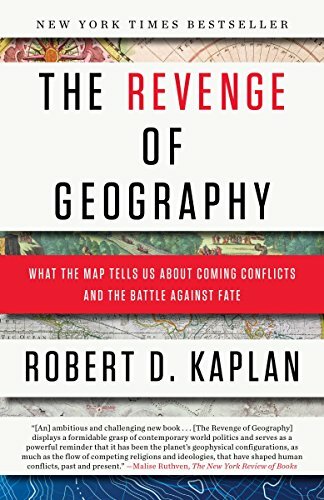 Bestselling author Robert D. Kaplan builds on the insights, discoveries, and theories of great geographers and geopolitical thinkers of the recent and distant past to look back at critical pivots in history and then to look forward at the evolving global scene. Kaplan traces the history of the worldâs hot spots by examining their climates, topographies, and proximities to other embattled lands. He then applies the lessons learned to the present crises in Europe, Russia, China, the Indian Subcontinent, Turkey, Iran, and the Arab Middle East. The result is a holistic interpretation of the next cycle of conflict throughout Eurasia, a visionary glimpse into a future that can be understood only in the context of temperature, land allotment, and other physical certainties. A brilliant rebuttal to thinkers who suggest that globalism will trump geography, this indispensable work shows how timeless truths and natural facts can help prevent this centuryâs looming cataclysms. About: NEW YORK TIMES BESTSELLER • In this provocative, startling book, Robert D.